How Will Anodising Affect the Dimensions of My Part? The thickness of an anodised coating can range from less than 5µm (for chromic anodising) up to 100µm (for hard anodising on certain alloys). Unlike electroplating, which is a deposit on the surface of the metal substrate, anodising is a conversion coating which transforms aluminium on the surface of components into aluminium oxide. The nominal coating thickness is not all build-up on the original surface and calculating the effect of anodising on a part’s dimensions requires some understanding of how anodising grows. It is important to be consistent in the use of units – failure to do so can have disastrous consequences! The SI unit of measurement used for coating thickness in the majority of standards, throughout our website and on any documentation we produce, is the micrometre or micron (µm) which is one-thousandth of a millimetre. 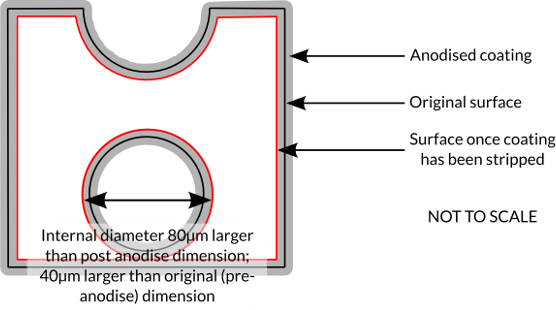 Older (outdated) engineering drawings or standards, or those originating from the US, may use imperial units such as mil (not the same as millimetres) or thou. Anodising is an electrolytic conversion coating – it transforms aluminium on the surface of components into aluminium oxide. Since aluminium converts rather than deposits, some of the thickness of the coating is ingress into the material and some of the thickness is growth out of the material. For most alloys, the anodised coating is approximately 50% ingress and 50% growth. The growth of coating from the original surface is therefore half the stated coating thickness. Internal diameters will get smaller by approximately the coating thickness and external diameters will grow. See illustrations below. You can use our anodising growth calculator to estimate the size of a feature after anodising. We recommend that you let us check your calculations. 20 to 70µm for hard anodising, with thicknesses up to 100µm achievable on some alloys. How will strip and reanodise affect the dimensions? In order to reanodise a part, for example when refurbishing a damaged item, it is necessary to strip the existing anodised coating first. This will result in a loss of material from the original surface, as shown in the illustrations below. Repeated strip and redo operations will increase the amount of material lost. It can sometimes be possible, dependent on alloy and thickness of original coating, to give re-anodised parts a thicker coating to restore original dimensions. Please contact us for advice.